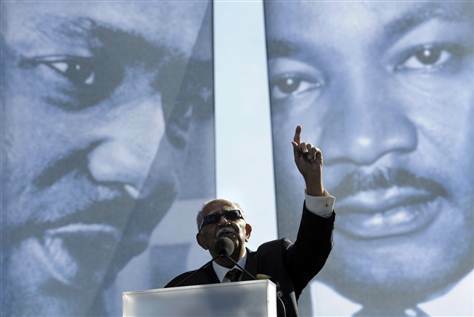 (AP) Thousands of people gathered Sunday to give the new Martin Luther King Jr. Memorial a proper dedication on the National Mall after its opening in August. Aretha Franklin, poet Nikki Giovanni and President Barack Obama were among those who honored the legacy of the nation's foremost civil rights leader during the ceremony, which people of all ages and races. "I know we will overcome," Obama proclaimed, standing before the 30-foot (9-meter) granite monument to King on the National Mall. "I know this," the president said, "because of the man towering over us." Obama and his wife, Michelle, and Vice President Joe Biden and his wife, Jill, joined a host of civil rights figures for the dedication on the sun-splashed Mall. The memorial is the first to a black man on the National Mall and its parks. "He had faith in us," said Obama, who was 6 when King was assassinated in 1968. Obama told the crowd, "And that is why he belongs on this Mall: Because he saw what we might become." The dedication has special meaning for the Obamas. The president credits King with paving his way to the White House. Before his remarks, he left signed copies of his inaugural speech and 2008 convention address in a time capsule at the monument site. The first couple and daughters Malia and Sasha made a more private visit to the site on Friday night, before the crowds and the cameras arrived. In his talk, Obama focused on King's broad themes — equality, justice and peaceful resistance — as the nation confronts, 48 years after King's "I Have a Dream" speech in Washington, some of the same issues of war, an economic crisis and a lingering distrust of government in some quarters. Referring to citizen protests against the wealthy and powerful that have spread from Wall Street and Washington, even abroad, Obama said: "Dr. King would want us to challenge the excesses of Wall Street without demonizing those who work there." The monument, situated between the Lincoln and Jefferson memorials in what the designers call a "line of leadership," was 15 years in the making. Several speakers noted that its designers could not have predicted then that the monument would be dedicated by the nation's first black president. Obama urged Americans to harness the energy of the civil rights movement for today's challenges and to remain committed to King's philosophy of peaceful resistance. "Let us draw strength from those earlier struggles," Obama said. "Change has never been simple or without controversy." King didn't say in the famous 1963 speech that he thought there could be a black president, but he did indicate his belief in interviews that it would happen one day. The crowd, some of whom came out as early as 5 a.m., included people of all ages and races. Some women wore large Sunday hats for the occasion. Cherry Hawkins traveled from Houston with her cousins and arrived at 6 a.m. to be part of the dedication. They postponed earlier plans to attend the August dedication, which was postponed because of Hurricane Irene. "I wanted to do this for my kids and grandkids," Hawkins said. She expects the memorial will be in their history books someday. "They can say, 'Oh, my granny did that.'" The August ceremony had been expected to draw 250,000, though organizers anticipated about 50,000 for Sunday's event. Actress Cicely Tyson said her contemporaries are passing the torch to a new generation and passed the microphone to 12-year-old Amandla Stenberg. The girl recalled learning about the civil rights movement in school and named four young girls killed in a 1963 church bombing in Birmingham, Alabama. "As Dr. King said at their funeral, 'They didn't live long lives, but they lived meaningful lives,'" Amandla said. "I plan to live a meaningful life, too." About 1.5 million people are estimated to have visited the statue of King and the granite walls where 14 of his quotations are carved in stone. As pastor of an Alabama church, King led the Montgomery Bus Boycott in 1955-56 that led to a U.S. Supreme Court decision that declared unconstitutional laws requiring segregation on buses. King then was elected president of the Southern Christian Leadership Conference which provided leadership to the growing civil rights movement and drew inspiration from the non-violent tactics used by Mahatma Gandhi. King led the massive civil rights protest in Birmingham, Alabama, and wrote the inspirational "Lettere from a Birmingham Jail." In 1963, he directed a peaceful civil rights march by 250,000 people in Washington where he delivered his famous "I Have a Dream" speech with its vision of a color-blind society. The following year, Congress passed the landmark Civil Rights Act and at age 35 he became the youngest man to receive the Nobel Peace Prize. He was assassinated in 1968 in Memphis, Tennessee, where he was supporting a strike by sanitation workers. The sculpture of King with his arms crossed appears to emerge from a stone extracted from a mountain. It was carved by Chinese artist Lei Yixin. The design was inspired by a line from the "I Have a Dream" speech: "Out of the mountain of despair, a stone of hope." King's older sister, Christine King Farris, said she witnessed a baby become "a great hero to humanity." She said the memorial will ensure her brother's legacy will provide a source of inspiration worldwide for generations. To young people in the crowd, she said King's message is that "Great dreams can come true and America is the place where you can make it happen." King's daughter, the Rev. Bernice King, said her family is proud to witness the memorial's dedication. She said it was a long time coming and had been a priority for her mother, Coretta Scott King, who died in 2006. Bernice King and her brother Martin Luther King III said their father's dream is not yet realized. Martin Luther King III said the nation has "lost its soul" when it tolerates vast economic disparities, teen bullying, and having more people of color in prison than in college. He said the memorial should serve as a catalyst to renew his father's fight for social and economic justice. "The problem is the American dream of 50 years ago ... has turned into a nightmare for millions of people" who have lost their jobs and homes, King said. Early in the ceremony, during a rendition of the African-American anthem "Lift Every Voice and Sing," the crowd cheered when images on screen showed Obama on the night he won the 2008 presidential election. But the Rev. Al Sharpton, a prominent civil rights activist, said the dedication was not about Obama but the ongoing fight for justice. He called for people from around the world to walk through the stone of hope and emerge to see "the face that brought us from the back of the bus to the White House." I can say I caught a chill watching President Obama, Michelle and Dr. King all standing there on the national mall. It was a proud moment for me.. Love it! Can't wait to go see it next month. Very inspiring. Definitely have to make a trip happen just to see the monument. It really wasn't that long ago. This is modern history. It's amazing how history puts things into perspective. Makes me wonder how these past few years will be regarded, even just 5-10 years from now. The president's speech to me was quite poignant. I know lots of people like to compare the two men. It's hard not to. All I can think of is the word GREATNESS. There is just something that makes me sit back in awe. To watch history in the making, to be able to touch history...makes me think about how much power we really have.